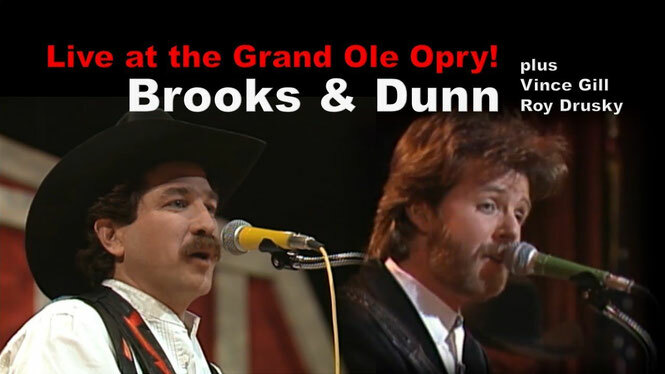 Brooks& Dunn live at the Opry! plus Vince Gill (feat. Jenny Gill), Roy Drusky. Full Show! - Newhillbilly website. 100% American Roots Music. Another amazing night at the Opry in Nashville, TN. Brooks & Dunn sing some of his biggest hits, plus Vince Gill (featuring his cute daughter Jenny Gill) and Roy Drusky. What a show! Don´t miss it. It´s gonna be fun! Brooks & Dunn is an American country music duo consisting of Kix Brooks and Ronnie Dunn, both vocalists and songwriters. The duo was founded in 1990 through the suggestion of Tim DuBois. Before the foundation, both members were solo recording artists. Brooks wrote #1 singles for John Conlee, Nitty Gritty Dirt Band, and Highway 101; both he and Dunn also charted two solo singles apiece in the 1980s, with Brooks also releasing an album for Capitol Records in 1989. However, they began hitting the charts together in 1991. Signed to Arista Nashville in 1991, the duo has recorded 10 studio albums, one Christmas album, and five compilation albums for the label. They also have released 50 singles, of which 20 went to #1 on the Hot Country Songs charts and 19 more reached Top 10. Two of these #1 songs, "My Maria" (a cover of the B.W. Stevenson song) and "Ain't Nothing 'bout You", were the top country songs of 1996 and 2001, respectively, according to the ''Billboard'' Year-End charts. The latter is also the duo's longest-lasting #1 hit single, at six weeks. Several of their songs have also reached the Billboard Hot 100, with the #25 peaks of "Ain't Nothing 'bout You" and "Red Dirt Road" being their highest there. Brooks & Dunn also won the Country Music Association Vocal Duo of the Year award every year between 1992 and 2006, except for 2000. Two of their songs won the Grammy Award for Best Country Performance by a Duo or Group with Vocal: "Hard Workin' Man" in 1994 and "My Maria" in 1996. All but two of the duo's studio albums are certified platinum or higher by the Recording Industry Association of America; their highest-certified is their 1991 debut studio album, Brand New Man, which is certified sextuple-platinum for shipments of six million copies. After announcing their retirement in August 2009, they performed their final concert on September 2, 2010, at the Bridgestone Arena in Nashville, Tennessee. Both Brooks and Dunn have continued to record for Arista Nashville as solo artists. Dunn released a self-titled album in 2011, which included the Top 10 country hit single, "Bleed Red", while Brooks released New to This Town in September 2012. The duo reunited in 2015 for a series of concerts with Reba McEntire in Las Vegas, Nevada.